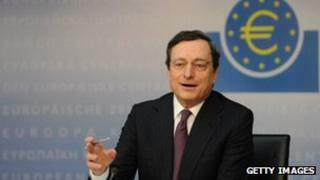 European Central Bank President Mario Draghi has said the worst of the eurozone crisis is over. In an interview with Germany's Bild newspaper, he said the situation in Europe was "stabilising". Mr Draghi also said that some economic data, including inflation and budget deficits, showed that Europe was doing better than the United States. But the latest surveys of purchasing managers, released on Thursday, suggest European economies could be flagging. "The worst is over, but there are still risks. The situation is stabilising," the ECB chief saidin his interview with Bild. Mr Draghi is credited with having deflected a much more serious crisis by lending European banks large sums at very low interest rates. Over two rounds, one in December and one in February, the Long Term Refinancing Operation injected more than half a trillion euros of new funds into European banks, a measure Mr Draghi described as "powerful medicine". "Last autumn, the situation was really critical. It could have come to a dangerous credit crunch for the banks. "As a result, businesses could have gone bankrupt, because they would have been left high and dry. We had to prevent that." But he cautioned that eurozone leaders still had work to do. "Investor confidence is returning and the ECB hasn't had to buy government bonds as a support for weeks. The ball is in the governments' court. They must make the euro zone crisis-proof for the long-term." The Purchasing Managers Indexes (PMI) survey thousands of companies and indicate whether business is expanding or contracting. The latest figures for Europe's most important economy, Germany, show that manufacturing activity shrank in March and new orders fell at the fastest pace so far this year. That contributed to a sharp downturn for the whole eurozone, with the PMI index showing that business conditions deteriorated further in March. "It's going to be a very poor-looking year at this rate," said Chris Williamson, chief economist at Markit, the company which compiles the PMI surveys. "We had an uplift at the start of the year, which we hoped was the economy regaining momentum, but it seems to be losing its legs."